Promoter: Penny Stocks Gone Wild Paying Party: 007 Stock Chat, LLC. Did you read my email on IOGA last night? This one could be a great medium-longer term play. And don't worry, we don't expect any gap ups today that will spoil potential returns for us. IOGA is fundamentally solid, with a strong business model to deliver desperately wanted solutions to government entities all across the US. IOGA has a strong revenue model that will deliver a growing and recurring income stream. IOGA is estimated to deliver $54 million profits in 2014. A prominent analyst has placed a $3.25 price target on IOGA, a 442% gain from yesterday's close. We have a short term price target (based on technical analysis) of $0.80, a 42% gain. The chart on IOGA is very bullish, trending in an up channel, but has pulled back to the bottom of the channel, giving us a perfect low risk/high reward entry. IOGA continues to release positive news about the Company which will encourage investors, thereby creating more momentum and liquidity. Again, unlike some previous plays, we don't need to worry about the dreaded gap up this morning, so you can take action with confidence that IOGA won't gap up big then sell off the rest of the day. We really like the investment thesis for IOGA, and we encourage you to read the email we sent last night (included below) to learn more about the Company. I will keep you up to date on any thoughts and news about IOGA throughout the day. Staying with the theme of higher priced plays with great charts and strong current momentum, we've found another excellent candidate. 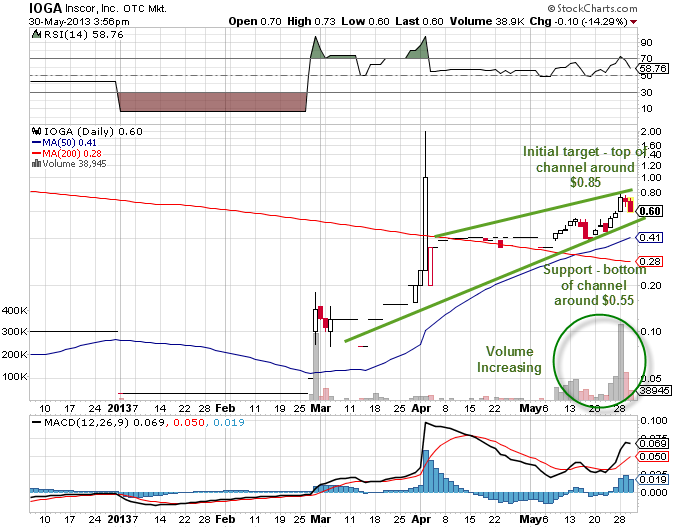 Focus on Inscor, Inc (IOGA) tomorrow. IOGA may be a little higher priced than recent alerts, but it's certainly not "overvalued", and it has a much better looking chart than most low priced pennies, and has momentum and volume already in place. If you don't think you can make money on a higher priced play like this, take a look at LOTE right now (and I could list about ten others that come to mind). We love IOGA for tomorrow because it's pulled back 20% or so from its recent break out highs. This gives us a great entry point before the next move higher. As you can see below, we have a strong channel up, with increasing volume. Remember, price follows volume, so we should see some strong price moves very soon. And we have another very good risk/reward setup here. The risk is only $0.05 or so, while our first target is around $0.85, a $0.25 move (42% gain) from the current price of $0.60. That's is about as good of a risk/reward trade as you will find. IOGA is a highly unique Company, one that will be in very high demand as US Local, State and Federal Governments come to terms with an estimated $3 trillion of unfunded Retiree Health Care and Other Post-Employment Benefits (OPEB). These liabilities could literally cripple an already fragile economy, and there must be a solution - fast. IOGA has developed a range of products that will essentially allow public entities to meet these liabilities over time, without taking on additional debt, without raising taxes, and without cutting spending even more. These solutions have been used by Fortune 500 Companies, and now IOGA have tailored them to the 67,000 some Government entities across the United States. The innovative Financed Insurance Trust OPEB plan, or FIT OPEB plan, is a customizable solution developed by IOGA which combines the procurement of specifically-designed life insurance on active employees using funds borrowed from the financial sector, or bond issuance, and secured by the insurance policies themselves. INSCOR's "FIT" (Financed Insurance Trust) innovative strategy generates substantial cash flow to fund these OPEB liabilities at little or no out-of-pocket costs to the municipalities. FIT plans can be modeled to not only provide significant volumes of life insurance, but also create substantial cash values that can be accessed to provide a tax-free income stream during retirement. In most cases, depending on age and insurability, FIT plans are designed with little or no out-of-pocket expense. These FIT plans tailored for high-net worth individuals, athletes and entertainers could be a sleeper revenue driver in the athlete market. In a nutshell, a FIT OPEB plan can provide a cash stream to support each year's OPEB obligations, plus fund future OPEB liabilities with little or no spending increases, tax increases, or reduction in benefits. Financing: Financing through established lenders with favorable terms specifically-designed to fund the premiums for life insurance. Insurance: Typically, Indexed Universal Life policies through a select group of companies are used in FIT strategies. The policies must offer the potential for high cash value growth without risk. Trust: FIT plans are generally modeled with a specifically designed trust to own the policy in order to provide for important benefits, including preservation of all tax benefits, protection against out-side creditors, and the availability to access the cash. We strongly believe IOGA could be a very good short to medium term trade, for many reasons. 1/ There is a strong fundamental story to the Company - a story that could develop realizing the Company substantial recurring year on year revenues. 2/ The chart is extremely bullish and liquid. Momentum is building, having recently broken out on strong volume and has since pulled back to support. 3/ There is a strong push by the Company to get IOGA in front of the investing community, for all the right reasons. We therefore expect many hundreds of thousands of investors eyeballs to be focused on IOGA in the coming weeks, if not months. And you are being alerted to IOGA first. Want Fast, Reliable Alerts Before the Crowd? Pennystocksgonewild.com may receive compensation and its employees and affiliates may own stock that they have purchased in the open market either prior, during, or after the release of the companies profile which is an inherent conflict of interest in Pennystocksgonewild.com statements and opinions and such statements and opinions cannot be considered independent. Pennystocksgonewild.com and its management may benefit from any increase in the share price of the profiled companies and hold the right to sell the shares bought at any given time including shortly after the release of the companies profile. PSGW has been compensated two thousand five hundred dollars by 007 Stock Chat for this one day profile of IOGA.